Figure 1. 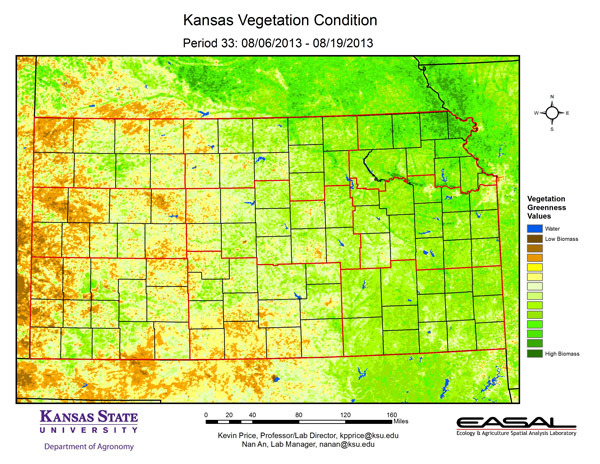 The Vegetation Condition Report for Kansas for August 6 – 19 from K-State’s Ecology and Agriculture Spatial Analysis Laboratory shows that biomass productivity is increasing in parts of western Kansas. The greatest photosynthetic activity can be seen in Brown and Doniphan counties. There is lower activity in Johnson County, just a short distance to the south. Figure 2. 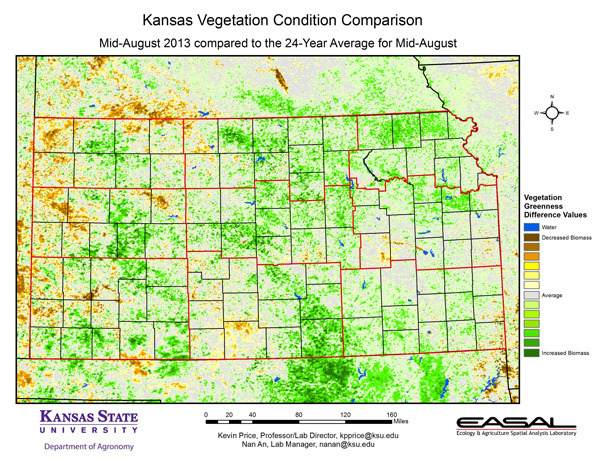 Compared to the previous year at this time for Kansas, the current Vegetation Condition Report for August 6 – 19 from K-State’s Ecology and Agriculture Spatial Analysis Laboratory shows that plant productivity is much greater. Higher rainfall and milder temperatures have resulted in much greater photosynthetic activity. Note that this does not mean there is no stress this year, just that conditions are much better than last year. Figure 3. 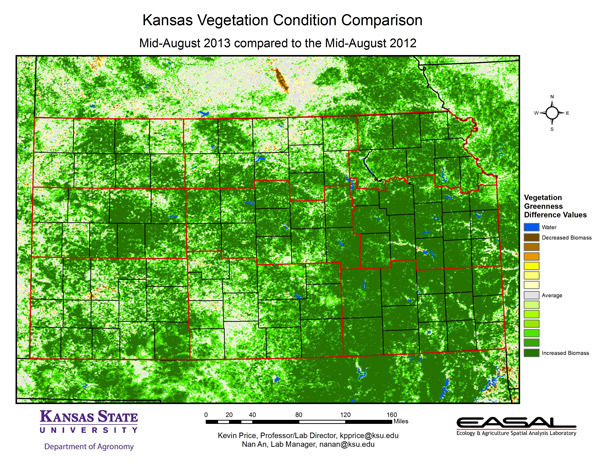 Compared to the 24-year average at this time for Kansas, this year’s Vegetation Condition Report for August 6 – 19 from K-State’s Ecology and Agriculture Spatial Analysis Laboratory shows that most of the state has at- or above-normal photosynthetic activity. Northwest Kansas continues to have much-below-normal biomass productivity. In east central Kansas, there continues to be below-normal production in eastern Lyon County as well as parts of Coffey and Osage counties. There is also reduced productivity in northern Barber County. Figure 4. 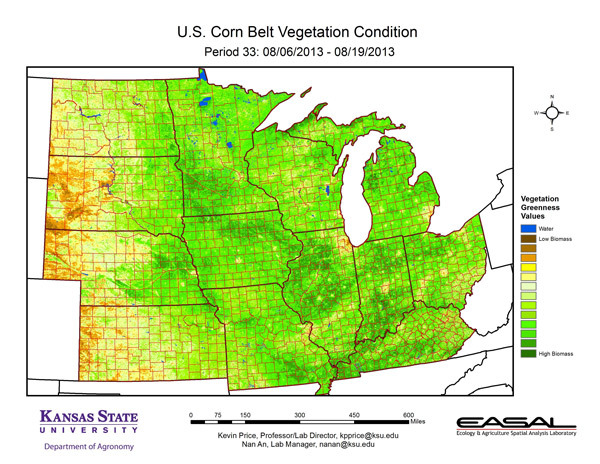 The Vegetation Condition Report for the Corn Belt for August 6 – 19 from K-State’s Ecology and Agriculture Spatial Analysis Laboratory shows that dry conditions in the upper Midwest are beginning to stress crops. There were also reports of spotty frost in north central Wisconsin. Figure 5. 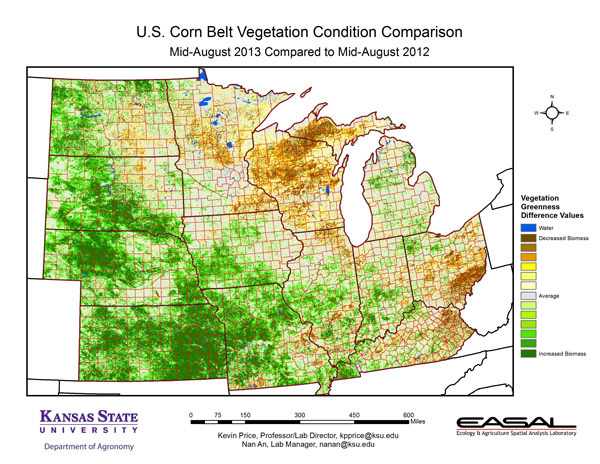 The comparison to last year in the Corn Belt for the period August 6 – 19 from K-State’s Ecology and Agriculture Spatial Analysis Laboratory shows that while the western portions of the region have higher productivity, Wisconsin and Northern Michigan have much lower photosynthetic activity. Cool temperatures and dry conditions have reduced productivity in those regions. Figure 6. 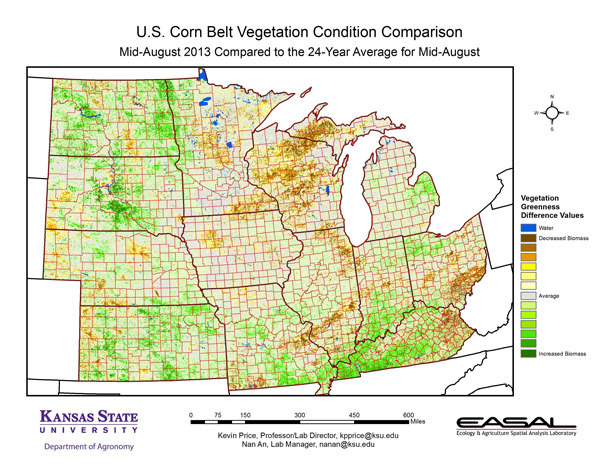 Compared to the 24-year average at this time for the Corn Belt, this year’s Vegetation Condition Report for August 6 – 19 from K-State’s Ecology and Agriculture Spatial Analysis Laboratory shows that while much of the region is near average in photosynthetic activity, the Upper Midwest shows much lower productivity. Cool temperatures and below average precipitation is beginning to have a visible impact. Figure 7. 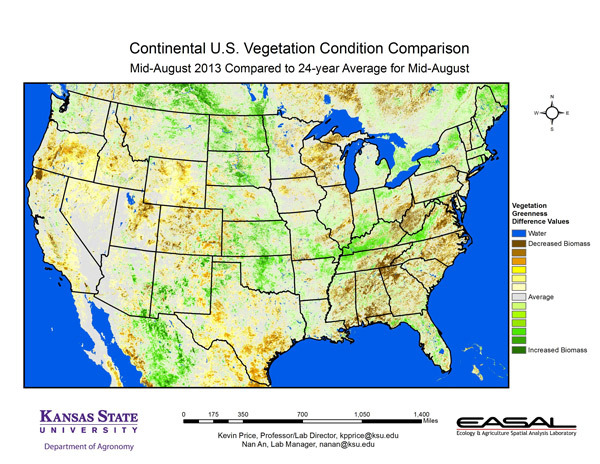 The Vegetation Condition Report for the U.S. for August 6 – 19 from K-State’s Ecology and Agriculture Spatial Analysis Laboratory shows that the east/west divide continues. Highest NDVI values are evident in the eastern U.S. In northern Alabama there is an area of reduced photosynthetic activity. Continued rainfall in this areas has hampered hay production, and there are reports of insect damage in some bermudagrass pastures. Figure 8. 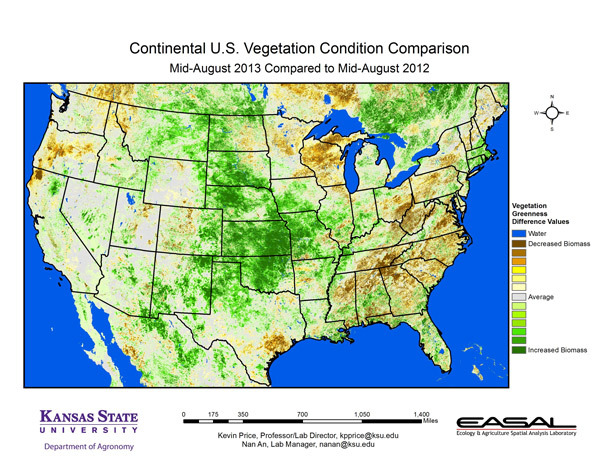 The U.S. comparison to last year at this time for the period August 6 – 19 from K-State’s Ecology and Agriculture Spatial Analysis Laboratory shows that the greatest increase in productivity is in the Central Plains. Much of this improvement is a testament to the extremely poor conditions present last year. This is particularly the case in western Kansas, western Nebraska, and eastern Colorado. Figure 9. The U.S. comparison to the 24-year average for the period August 6 – 19 from K-State’s Ecology and Agriculture Spatial Analysis Laboratory shows that much of the country has close to normal productivity. 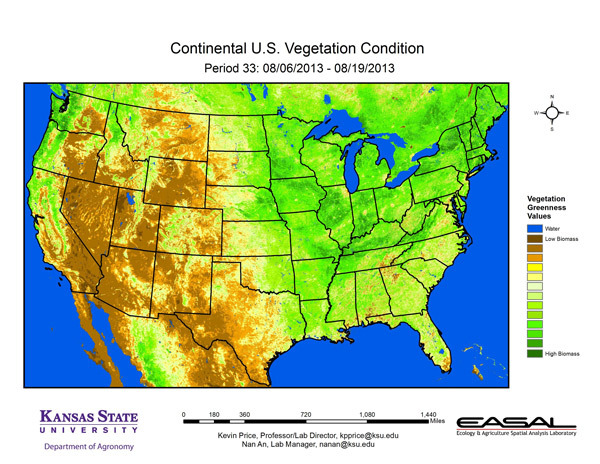 There is a noticeable reduction in photosynthetic activity in the Southeast. Continued rainy, cloudy weather has had a negative impact in this region. In contrast, continued warmer-than-average temperatures and below-average precipitation is taking its toll in Oregon. Fifty percent of the range and pasture is rated in poor to very poor condition in that state.